Clean and bright condo in Ravencrest! Great room with gas fireplace. Wood laminate floor throughout living/dining and kitchen. Kitchen has breakfast bar and pantry, walkout to wood deck. Half bath on main makes having visitors easy. Upstairs, master bedroom has walk-in closet, big windows for lots of natural light, adjoining 3/4 bath. Second bedroom has attached full bath. Finished basement (carpet, including stairs, has just been replaced) has third bedroom, 3/4 bath and laundry room. Listing provided courtesy of Bodewin Realty. Harling Real Estate | HomeSmart Realty Group- Licensed in the State of Colorado. The real estate listing information and related content displayed on this site is provided exclusively for consumers’ personal, non-commercial use and may not be used for any purpose other than to identify prospective properties consumers may be interested in purchasing. 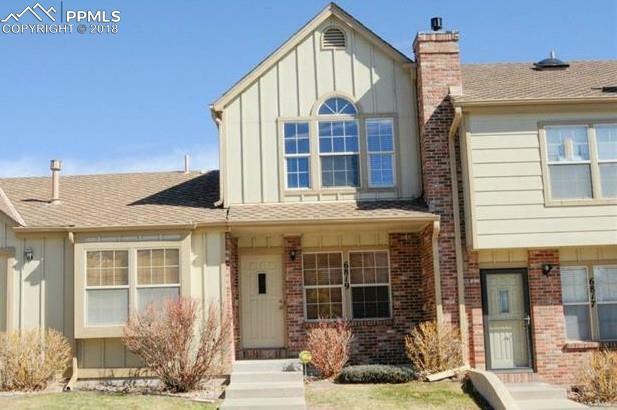 This information and related content is deemed reliable but is not guaranteed accurate by the Pikes Peak REALTOR® Services Corp. Data last updated 2019-04-19T06:41:09.4.